Carolyn heard the screen door slam and heavy boots stomping up the carpeted stairway. She jumped up and down, jiggling herself into skin-tight jeans and flopped back on the bed. Gut sucked in, she pulled the zipper up and secured the button. A devilish grin spread across his face. He landed on top of Carolyn, kissing her face, her neck and fumbling with the button on her jeans. Carolyn covered her face with her hands. Jeremy jumped back up, grabbed her arm and pulled her up to her feet. He leaped down the steps, two at a time, and she followed him out. Still slipping on her shoes, she heard the engine outside rev. 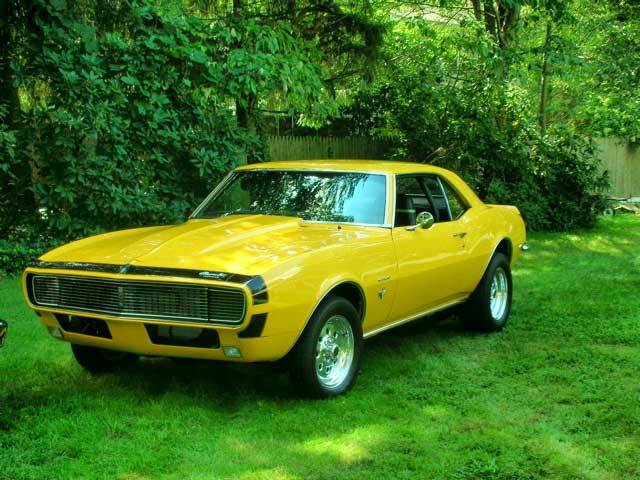 She pushed through the screen door and saw him holding the passenger door of the yellow Camaro open for her. She got in and he slammed the door. He drove up Union Street and up over the Union Street Bridge. He turned onto an unused off-ramp that headed towards the old train yard next to the abandoned iron mill and the machine shop. 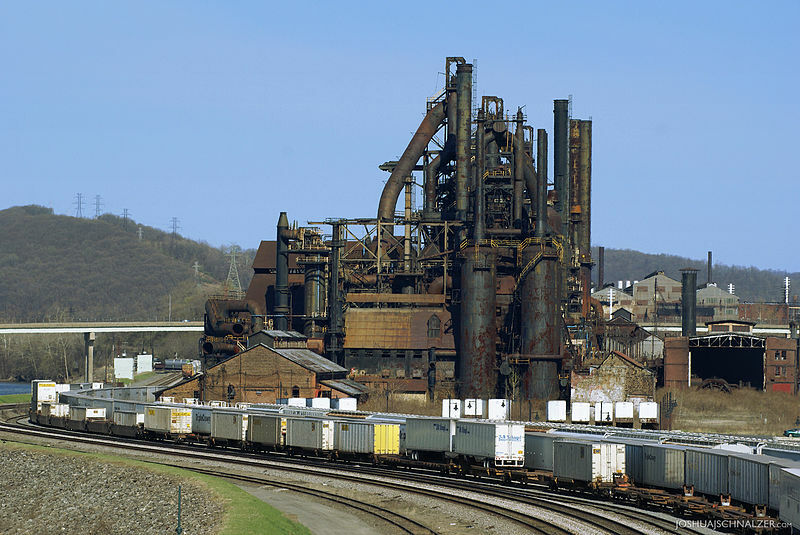 Carolyn looked over the red-rusted buildings of the mill, the overgrown train tracks and could see the river beyond the row of weeds and low bushes. Crickets chirped in the late-summer, late-afternoon heat. The engine from a diesel locomotive droned on behind the rattle of the traffic crossing the metal bridge. A lonely train whistle blew on the other side of the river. The Camaro’s tires crunched on the gravel parking lot and Jeremy killed the engine. He was at her door in a flash, opened it and pulled her behind him. They climbed over a barrier and through a roped-off area towards the train tracks. 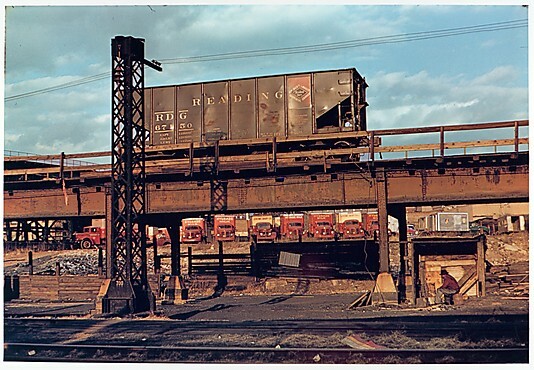 “Viola!” he said and held his hands up next to an abandoned box car. He grabbed a rusty, empty five-gallon paint can and turned it upside down. Carolyn stepped up onto it and climbed into the boxcar. The floor had been swept and a sofa stood along the narrow end. “Who knows about this?” Carolyn said as she toed at a pair of underwear and a ripped t-shirt. Carolyn raised her eyebrows and sat down. Jeremy knelt on the sofa, reached behind it and produced a bottle. “Here, want some?” He handed her the Southern Comfort. “Just sip it then…hey, what’s this?” he said and pulled up a suitcase. He threw it on the sofa and let himself fall onto his backside with a thud. Click click. He opened the suitcase and whistled through his teeth. Carolyn sipped at the Southern Comfort and looked at him out of the corner of her eye. She screwed the cap back on. “Who does that belong to?” she said. “Hell if I know.” Jeremy riffled through a pack of hundred-dollar bills. The diesel engine hummed louder up the tracks somewhere, like a sleeping dragon. He jumped up and grabbed her by the hand before she could jump out of the box car. They watched as two black sedans with tinted windows pulled into the parking lot and stopped next to the Camaro. Jeremy, never letting the suitcase drop, backed up against the door on the opposite side of the box car. He tugged at the door and it scraped open. Carolyn looked out, down a thirty-foot drop to the river. They heard men’s voices out in the yard. The diesel engine roared really close now, right up against the box car. Boom! The loc coupled with their box car. They both staggered and regained their balance. “We have to jump,” Jeremy said. Carolyn felt his hand on her back and that dizzying sense of falling, like she’d had in nightmares. Twigs snapped and she felt her body impact with the earth, rocks boring into her spine. Her eyes refused to open but her hearing was sharp. Her breathing came in painful gasps. A dull thud vibrated next to her. “I got it,” Jeremy said. Carolyn felt him shake her. She could not move. “Psst. I got it. I got the money!” He shook her harder. “Carolyn! Wake up!” he whispered, his breathing revealing panic. “Sztttt.Sztttt.” That unmistakeable sound of walkie-talkies staticked overhead. Men shouted. Jeremy shook her again and tried to pull on her arms. She could not stand up, she was sure of it. This entry was posted in Short Story, Writing on June 17, 2016 by lauralibricz. The best thing about living in central Europe is the availability of public transportation. Don’t even have to fly. From where I’m sitting, I can be in Nuremberg in thirty minutes, I can be in Munich two hours, Prague in four hours, Vienna in five, Brussels in, say, seven hours, and London in twelve. High-speed trains. The railway expansion is causing chaos on Bavarian streets at the moment. Everywhere you turn, and I mean everywhere, bridges are shut and roads are dug up. But when it’s done, those trains’ll be faster than ever. 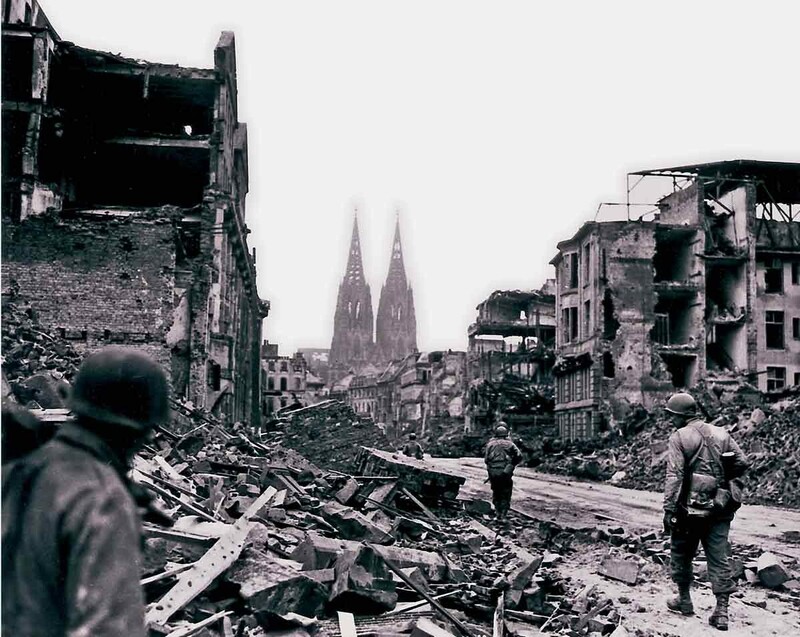 I can get to the city of Cologne in about four hours. After passing Frankfurt, the train makes a picturesque journey along the Rhine River, past the mystical Lorelei, impressive at the least, breathtaking at the best. 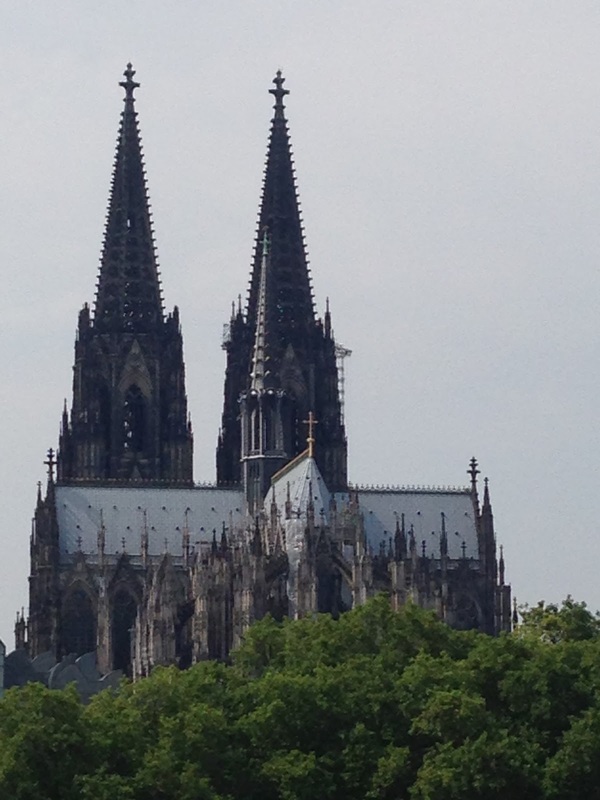 Breathtaking: the first impression of the famous Kölner Dom, the Cologne Cathedral as one exits the train station. Work began on the cathedral in 1248 and stopped in 1473. It was finally finished in 1880. It is 474 ft long, 283 ft wide and its towers are approximately 515 ft tall. It is the world’s largest Gothic cathedral. 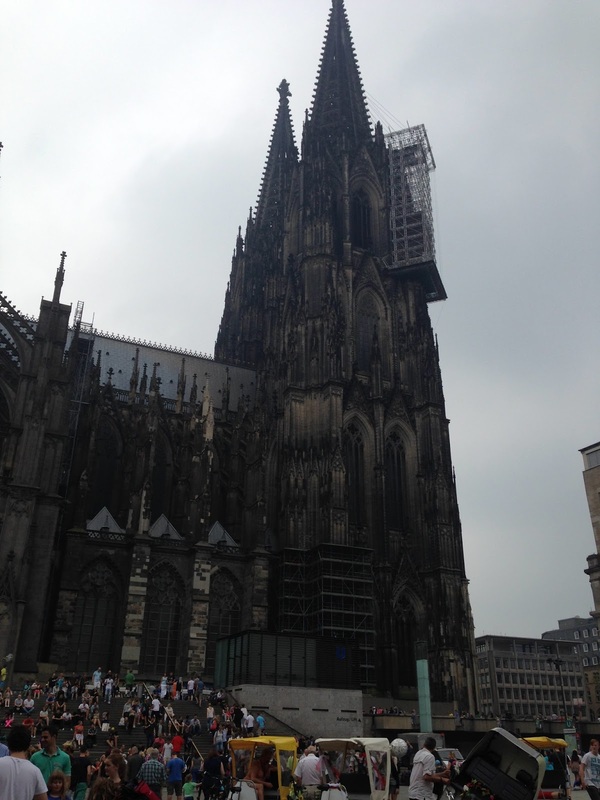 From 1880 bis 1884, the Kölner Dom was the highest building in the world. 20,000 people a day visit the cathedral, that makes how many million every year? The cathedral has eleven bells, the largest which weighs 24,000 kilos. 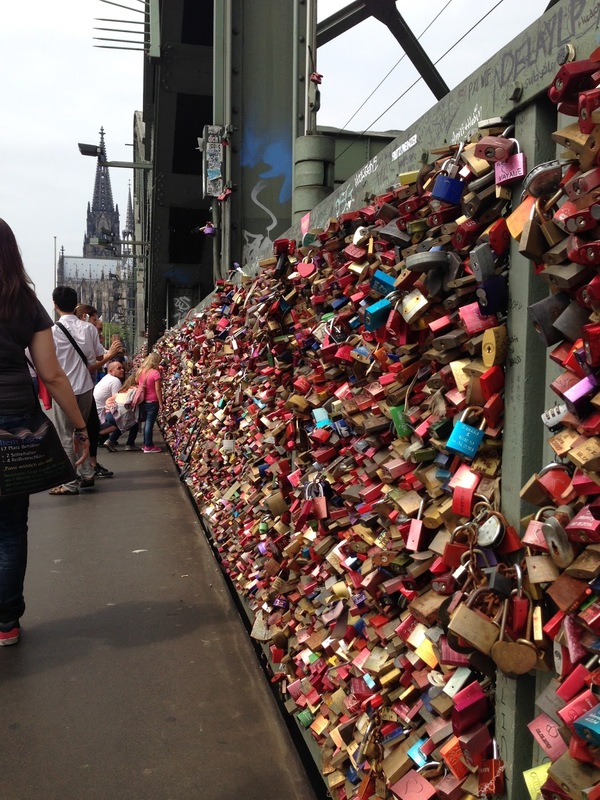 It costs about 10 million Euros a year upkeep. This entry was posted in Germany, History on June 13, 2016 by lauralibricz. Please join me this afternoon at the oldest book store in the world, The Moravian Book Shop, in beautiful downtown Bethlehem, PA. Hope to see you there! This entry was posted in Books, Germany, Heaven's Pond, History on June 10, 2016 by lauralibricz. New York, New York. 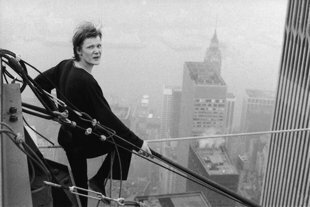 This morning, Phillippe Petit, 24, was arrested for disorderly conduct and criminal trespassing after entering the World Trade Center and stretching a high wire between the two towers. Petit, assisted by six accomplices, has been taken to Beekman Downtown Hospital for psychological observation. A traffic jam formed in the streets below at 7:15 a.m. as spectators gathered to watch Petit 1,350 feet above them dance on the wire. 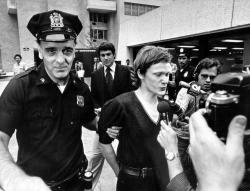 After eight passes back and forth between the towers, approximately 45 minutes, Petit surrendered to waiting Port Authority of New York and New Jersey police officers. The seven men reportedly spent the last three days, disguised as construction workers with fake IDs, lugging their gear up to the top floor of the tower, including the 450 pound inch-thick tight rope and a disassembled 50 pound, 26 foot custom-made balancing bar. They spent the whole night setting up the tight wire. Using a bow and arrow, a line was shot across from one tower to the other and used to pull subsequently thicker ropes across. Then the tight wire was pulled across, fastened and stabilized with two guy lines to minimize swaying. But survive the stunt he did and it is the topic of his book To Reach the Clouds, now released as a paperback titled Man On Wire. 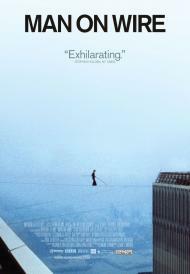 Man On Wire was not only the description of his crime on the police report, but the title of the 2008 award-wining British documentary directed by James Marsh. That’s my DVD tip for the weekend. Where were you on August 8, 1974? This entry was posted in People Watching on June 6, 2016 by lauralibricz. I used the random first line generator but I didn’t use it as a first line: He had waited twenty years to return it. Writers: you never need suffer writer’s block. Not when we have toys like these random generators to play with! A light snow fell and covered the street with a hush. The sky was the same dirty grey and darkened so early on this December afternoon. His muffled footsteps crunched along the unshoveled sidewalk, droning on, a labored repetitive action. He watched the fine flakes drift past and settle on the frozen mounds, an accumulation of these last few stormy days. His foot slid and he caught his breath. A muscle strained in his bad hip. Something caught his boot and he heard metal scrape. He steadied himself and bent down as far as his hip would allow him. A chain-like thing, snagged in the wooden fence, had a hold on his boot’s shoelace hook. He untangled the silver chain from the fence and his boot and held it up, away from his face. He padded his pockets for his glasses but he had left them at home. The chain was easy a meter long. A swan-shaped pendant swung; a much-too-heavy thing to be dangling from such a fine chain. The swan had its wings spread and its beak pointed towards the sky. From its belly hung a tear-drop opal surrounded by silver-colored filigree. He pulled at the swan’s beak with his gloved finger. If this was silver, it would bend. But this was solid and heavy. He knew nothing about precious metals, but something told him this was no ordinary ladies’ costume jewelry. He wound the chain around his wrist, shoved his hand in his pocket and made his way home. Fire crackling in the open hearth and the smell of pitch reminded him of coming back to this house as a child after trekking home from school. Even after multiple rental apartments in foreign countries, this would be his only real home. It was quiet now, one of the downfalls of living alone. Downfall and upfall. He hung his black woolen coat on the back of a chair in front of the fire, sat on the chair, undid his boots and set them next to the woodpile. He threw two logs onto the fire and sparks rose up the flue. He held his hand up and the silver chain unraveled once. The swan pendant glittered in the firelight and the opal took on the glow like a smoldering ember, almost as if it had swallowed the warmth. He had only seen such an opal once. He bought it for Lena. Spent a whole week’s wages. An opal on a silver chain but nowhere as costly and fine as the one he held in his hand. He never saw Lena again. That afternoon he had to flee the city. He stood and slid his feet into his felt pantoffels. He opened the drawer of his writing table, pulled out a silver cigarette case, flipped it open and stuck a cigarette between his lips. The flame from the silver butane lighter flickered and lit the cigarette. The lighter slid out of his hand, back into the drawer and rolled way back inside, resting upon a secret compartment. His eyes squinted against the plume of smoke that rose about his head. He snapped the compartment open and produced a purple velvet pouch the size of his fist. He opened the drawstring and slowly pulled on a fine silver chain. An opal plopped into his hand. He set the pouch aside and held the two opals up like he was displaying metals he had won for running a race. The opal hanging from the flying swan was smooth and refined; the links of the chain looped in and out like sixes and nines. Nimble fingers were needed to create a chain of this complexity. The roughly-cut opal he had bought for Lena hung from a chain of simple links. This diminished its beauty not in the least. It was a snowy December day like this one, twenty-two years ago. Lena had given him her portfolio to safekeep, a leather folder tied with a leather cord, full of drawings and photographs. They had arranged to meet by the train station and together they would escape the madness. But he had stopped at the jewelers to pick up the opal and approached the train station from the back. He saw the throng. Police were arresting bystanders at random. In the confusion, he boarded the train before anyone saw him. He had waited twenty years to return the portfolio. An address found in a phone book, belonging to a name that was close enough to hers, was enough to still the nagging guilt he nourished over the years. He received no reply. He would never contact the name or address again. He dropped his cigarette in the remains of this morning’s coffee. He put both chains into the purple pouch and shoved them to the back of the drawer. This entry was posted in Short Story, Writing on June 5, 2016 by lauralibricz. Today we’re riding on a regional train from Nürnberg. The journey takes an hour and a half and costs 20€. We’re feeling quite fit, the weather is perfect, so we take on the half hour walk from the train station in Coburg up to the fortress, The Veste Coburg. 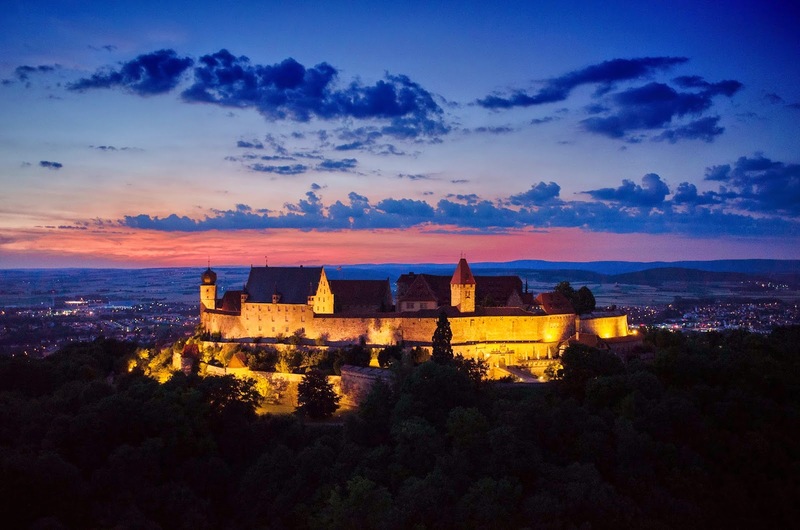 In the 11th Century, the hilltop above Coburg housed a monastery. Over the generations, the buildings underwent exstensive expansion the walls were fortified. Today the fortress houses an impressive collection of historical artifacts, paintings and sculptures. 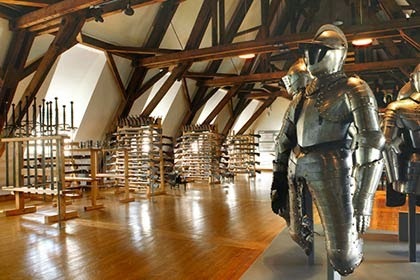 The collection of historical weapons and armor dates from the 16th and 17th Century and is the largest collection of its kind in Germany. The huge collection of historical hunting weapons dates from the 16th Century to the present and includes weapons from all across the European continent. 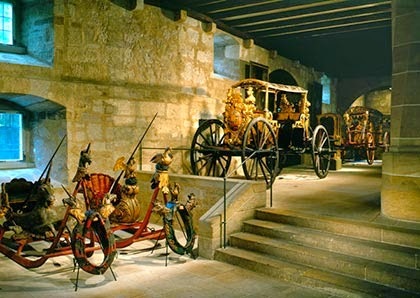 On the ground floor of the Duchess’s wing, carriages and sleighs are on display; a bridal carriage from 1560 and Queen Victoria’s Gala Coupe from 1840. And the high point of this visit is the Intarsia Hunting Room. 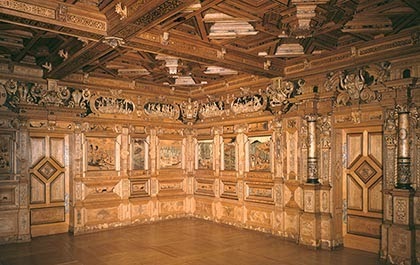 This masterpiece of 60 panels of inlaid wood was completed in 1632. Follow the link under the picture for an impressive panoramic view of the room. This entry was posted in Castles, Germany, History on June 1, 2016 by lauralibricz.